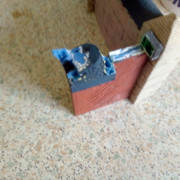 I am slowly repairing the models but some are beyond this - being hit by a fence panel in an 80mph gale is sort of terminal. But e-mails to Piko and others have produced the required missing parts and I have taken the opportunity to redesign and cusromise my models. The Brassica station was the worst hit, (literally), so in the morning I am going to have to see what is repairable and what I will need to print again... The footbridge will require some glue and de-twigging. It was found in my Medlar bush. I knew it would be bad... The "shear" failures are several and dead easy to fix. Slop on more glue! However it is the number of "twist" failures that are going to delay matters. 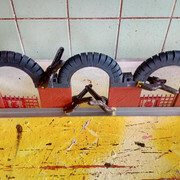 The twisted parts have to be excavated from the model, new parts printed, glued into place and then painted to match. As you can see once the parts have been excavated it will be an easy task of printing the replacements. 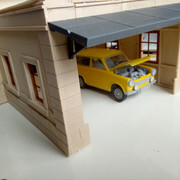 This is a picture of the rebuilt garage. I think I am finally getting the better of things? I have given a new top coat of black paint to the exterior of the wooden plinth that holds Brassica. I have also had to help clean the nextdoors highly ungrateful cat of black paint... One of the supports for the east european station has been replaced. The securing screwa tore the top out of it when the platform base was hit by the blast. 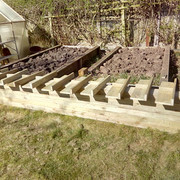 I am now in a position to think about buying a hernia belt as the planks and timbers that will for the doubled up Great North Straight are hopefully drying on the lower raised veg beds. As I use "plank on post" I have got to order the posts (both 10 and 7.5cm sq) in 2.4m lengths, plus the metposts to hammer into the ground. This is always a problem for me... I live on the edge of the escarpment and soil depth is either good - or nonexistant!!! There are several metposts that had to be shortened with the angle grinder. Once the six straight sections are complete it is then the turn(!) of the corner pieces. I have a feeling these will involve the production of several new volumes of swear words!!!! I have made three straight sections and bust my left knee... Still I am happy with the afternoons work. 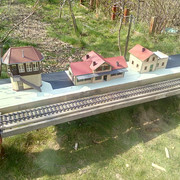 I have yet to order the "metposts" and wooden posts that will support the track bed sections. So what I am going to do is order a dozed "metposts" and say five 2.4m long posts. I know that this is not going to be enough -but it will let me know how many I am short of completetion! Work stops for today with acute "Ow my back" and "Agh my knees"... All six straights are complete and I have been able to build fourteen of the external sides to the facets that will make up the double track corner. The Brassica station parts that can be easily stuck together are setting in the kitchen. Most of the "ice lace" roof has survived but will require stripping down and repainting. The reprap is printing the required parts as I type. I do have a model awaiting installation of the widened GNS to sit at the ends of the track. This a scale "Building II" that was made to house "the twins" at Derby. And here the first pieces that have been stuck. (Two hour epoxy). Brassica roof is now under supervised repair. Thw platforms have been "filled" and repainted. 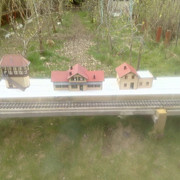 The platform for the East European station has been mounted on its legs and given a first coat of cheap white emulsion. This gives me something to draw on with a pencil to get the buildings in the right position. Roads and paths can be marked and the lines of fences have to be pencilled in. I will have to go ahopping in the morning for more "mid stone" masonry paint for it. I made a new template for the 5° angle cut at the end of each piece of the facets for the curve. This was done with mathematics rayher than a protractor. I know with my eyesight I can "dot" to within 0.5mm with a rular. Could I get that accurate across a 195mm space -I sincerely doubt it!!! So, it is out with the chp saw tomorrow morning. 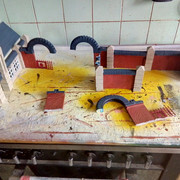 Now to install the "vanity blocks" to help the buildings stay put and then start the main paintwork. The next step is precision measure and a 14lb sledgehammer.